Written by owl and bear staff on Tuesday, September 27th, 2016 at 8:30am. Icelandic post-rockers Sigur Rós played a dark set at Copley Symphony Hall on Friday — in more ways than one. Okay, two ways to be exact. 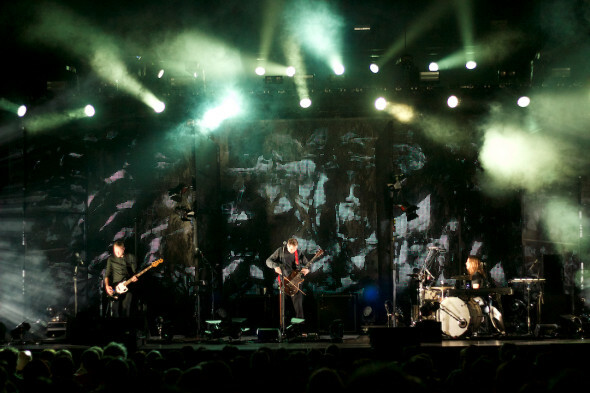 Sigur Rós made use of the underlit concert hall with abstract images that fluttered across the LCD screens adorning the stage behind them. Perfectly timed strobe lights bathed the attendees in jarring bursts of brightness before returning them to the shadows. And the music itself was just as dark, seemingly conveying complex existential emotions that we don’t have words for in English. There may not be words for them in any language for that matter, which could explain why the band had to create its own, Vonlenska, to sing in on their classic ( ) album.